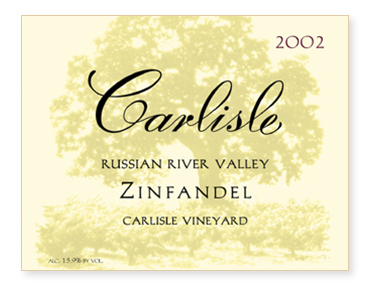 Old-vine Zinfandel in the Russian River Valley was tricky business in 2002. Many vineyards hung way too much fruit, not even reaching minimum sugars. But as owners of Carlisle Vineyard, we farmed aggressively, limiting yields to 1.6 tons to the acre, and picked on October 22 nd at perfect ripeness. No adjustments to sugar or acid were needed. Fermentation began on its own after a 7 day cold soak. Malolactic completed naturally the following spring. I bristle at the marketing term "non-interventionist winemaking" but this was about as non-interventionist as they come.